Have a keg of beer, but want to fill some bottles to take with you to the game, beach, or friend's house? The BeerGun is a great way to fill bottles from a keg. Every part that comes into contact with your beer is stainless steel. This unit features a CO2 purge, which helps to prevent oxidation during filling. Includes tubing and a brush for cleaning. The Version 2 BeerGun will soon become the standard for rapid handheld bottling. This new model features an ergonomic handle, with valve controls placed conveniently at your fingertips. This upgrade is easier to clean, and even easier to use. If you've used other bottlers, but been disappointed by confusing controls or foaming, then this is the Bottle Filler for you. This new model comes enclosed in a plastic tool case, and includes the fittings needed to connect to your keg (Normally a $25 separate purchase!). Positively retained beer gun seal tip - no more lost tips! Filling still product with bugs - keeping the funk out of our brewery's clean system. Hoping to do quality bottle fills for storage and competition. I bottle keged and carbonated beers for gifts to friends. I got tired of the old racking cane and rubber cork. This seems like the best way to make bottling from a keg easier and more oxygen free. Need to bottle for competitions. To fill bottles for homebrew competitions and bottle shares. People I know that use one of these say its the best. Research shows that this is easier to use compared to counter-pressure filler. Need somethin reliable to bottle my beer. Blichmann has a good reputation. This product has excellent reviews and is something that I am willing to pay a little extra for to get top quality and outstanding performance. Ease of use also aided my decision. This is a gift selected for my son at his requst. He has been brewing beer for several years. I own the first gen version and love it. Getting V2 for bottling competition entries for the brewery. I want to be able to instantly bottle beer to give away to friends and this seems like a very convenient way to do that. Thanks Blichmann so much! Does this work with a pin lock system? BEST ANSWER: It comes with a ball lock connection. You would need to purchase a pin lock connection with an MFL fitting. So, this is not a counter pressure style unit? Is foaming an issue, and if not, what is preventing foaming and why? Besides co2 purge, is it better than a tube attached to your faucet? BEST ANSWER: Foaming generally isn’t an issue. Set the PSI of your CO2 tank low when filling. This product works significantly better than a tube attached to your faucet. No it's not an actual counter pressure bottle filler. Most of these aren't. In order for that, there has to be some kind of stopper to make a seal, and then an adjustable release valve to let out the co2 and pressure to start letting the beer flow. A true counter pressure bottle filler example for the Homebrew scale would be the Williamswarn counter pressure bottle filler, but it's $. With this one, you will be able to purge with co2, and you will get foam unless you control the flow via your co2 regulator and keg pressure. Even then, you can still get foaming with higher carbed beers(which is what I like). It's not counter pressure, no. I haven't really had any significant trouble with foaming as long as I make sure the pressure in the system is quite low (and I throw the whole thing in the fridge a few hours beforehand). I'd say the CO2 purge is the main benefit. It's also more comfortable/convenient to use than a jury rigged setup. So it's great if you expect to be filling a good number of bottles (I did a bunch for my wedding), but probably not worth the price if you're only ever doing a few at a time. Foaming can sometimes be an issue but if your bottles are cold and you leave some residual water in them it will break the surface tension and reduce foaming. Dont put them in the freezer though ice crystals can provide nucleation points for foam. I can usually get a black fills with up to 2.5 volumes taking the necessary steps mentioned. Is cleaning easy and what is the procedure? I’m a bit of a sanitation freak! BEST ANSWER: Hi Brett - Most of the parts on this model come apart to allow full immersion in sanitizer. Do I still need to connect to a Co2 tank, if the beer side of a gun is connected to my Intertap faucet with the ball lock fitting? Ultimate goal is to fill bottles without kegerator door open, as Co2 tank lives in inside it. I realize I'd be forfeiting the ability to purge the bottle with Co2 if I don't get a second tank. BEST ANSWER: No, a second Co2 tank is needed. This beer gun is super easy to use and a snap to clean. Works as advertised, easy to use to fill bottles without losing any carbonation. Definitely the easiest way to bottle beer from a keg. Only downside is that it's a bit annoying to disassemble. You have to remove the stopper and clip at the end of the beer gun to disassemble, and the only way to do that is to force it off. So the first time I was cleaning it I was a little worried I was going to break something, but it popped off with enough force and everything was fine. You can use it successfully without any tools, but I do recommend using a wrench to tighten the CO2 line to the gun when filling (only a little force is required to get a good fit). If you hand tighten the fitting it will get loose while filling and you'll lose some CO2. Thank you so much for your feedback regarding the BeerGun. We really appreciate the honesty and value great feedback like this as it helps us improve our products. Cheers! Despite following all instructions and advice. It foams too much. I have a simple pale ale. I've lost about half the keg trying to bottle with this thing. The bottles are cold, the gun is cold, the PSI has been vented and dialed down to 2.5 psi, the bottles are filled on an angle. The trigger is quickly and fully engaged. The lines are 10 ft long. The bottles foam like crazy. I'd say 3" of beer and the rest foam. This is a bad investment. Not sure how to return this thing. Works great once it's set up! The beer gun comes assembled and the owners manual said to disassemble an clean before use. Unfortunately I was not able to get the CO2 tube out of the grip as instructed. The guide says it's held in by an "O" ring and should just pull out. Well, I pulled on it and it didn't move. I suspect the design has changed and the CO2 tube is held in in another manner. I was able to clean an disinfect the CO2 tube while attached to the grip. Another issue was with the liquid line attached to the grip. The owners guide said that the line will stay put in the grip when in use. After 2 bottle fills the liquid line popped off the tube and beer went every where. I ended up fastening the liquid line to the grip with a hose clamp. Once everything was set up properly, it worked as expected. I called MoreFlavor customer support but they could not help. I have a support request into Blichmann Engineering to understand the CO2 tube issue. Are you looking to bottle your beverage with ease? Just get this. I JUST BOTTLED A FEW (25) FROM CORNELIUS KEG WITH BLICHMANN BEER GUN. WHAT A PLEASURE! AFTER DEBATING THE GUN VERSUS COUNTER PRESSURE, I'M SURE I GUESSED RIGHT! THE BEER HOSE TO S.S.GUN BEER TUBE BLEW OFF ONCE; MAYBE WILL GET A DUAL REGULATOR IN ORDER TO HAVE SMOOTHER CONTROL OF CO2 PRESSURE TO KEG. ORDERED 1/4" MFT? FLARE CONNECTORS TO ENABLE QUICKER, EASIER CONNECTIONS TO CO2 REGULATOR. I READ ABOUT & UNDERSTOOD HOW BLICHMANN GUN WORKED BUT THE ACTUAL USE WAS EYE-OPENING. So instead of buying the knockoffs I figured I'd pay the $100 for the real Blichmann beergun because surely it's engineered to a standard with good QA from the manufacturer. Overall it's a pretty nice design but mine has a couple flaws and I don't know if it's a manufacturing issue or design issue yet. Problem 1: When assembling the gun you have to insert the tube up though the handle system until it seats. There is a groove in the SS tube that looks like its "supposed" to seat and lock in with an o-Ring that is stationary and built into the gun handle. When mine is fully assembled the spring pushes the tube back out of the handle about 3/8"-1/2" so the groove in the tube is visible. This doesn't seem to cause a leak that I can detect BUT what happens is, because the whole tube assembly is not fully inserted anymore, the beer tube doesn't have enough pressure to prevent beer from poring out of the gun past the rubber stopper. So for my gun I have to constantly hold the tube up and fight the spring to keep the SS tube assembly seated and the gun working properly. My opinion is the internal o-ring that is supposed to catch the groove in the SS tube is not sized correctly and does not hold the SS tube in place with enough force, so the spring pushes it back out. Problem 2: The Beer trigger mechanism snaps on and off but is WAAAAAY to tight at the top end. In order to remove the trigger mechanism I have to put a screwdriver into the slot and twist so that it spreads enough to remove from the small tube. This wouldn't be so much of an issue except that there is no way to use the screwdriver AND apply leverage to remove the trigger at the same time. I can get it, but I swear to Jesus Christ a LOT while doing it! There is a part of the black gun handle that interferes with my ability to use my thumb to push the trigger out of the tube slot, so its a total PITA. My solution is that I'm going to have to use my vise to permanently spread the trigger mechanism slightly so it doesn't hold so tightly. If that doesn't work I'll set it back and just drill the detent out a bit. Either way, for an engineered product, I could probably have bought one of the cheap knockoffs and put the same amount of modification work into it to make it work better. That's my feedback, take it as you will. Hello Will - Thank you for your review, while we understand your frustration, these manufacturing issues seem out of the ordinary. Please give us a call at 1-800-600-0033 or email us at info@moreflavor.com so that we can assist you. We are here to help. Cheers! The beer gun is easy to use and easy to clean. I love the way it comes apart without any tools. I replaced the beer line that came with the kit because it smelled extremely chemically. Don't know if this would have affected the beer flavor as I replaced with something I had on-hand. I would definitely recommend to a friend. I have had a Beer Gun (version 1) for several years. I do not see any particular reason to migrate to version 2. Most of my beer is kegged. I hate bottling, but sometimes it is necessary. I only bottle beer to give away to friends, or for gifts, etc. The Beer Gun works nicely if you follow the instructions. Here are a few things I have learned over time. - be sure that your sanitized bottles are well chilled to the same temperature as your beer (to minimize foaming). Typically my bottles & beer at about 40° F.
- be sure to use the 10' foot hose length (sanitized) to minimize foaming. - when filling, place the bottle into a container ( I use a 9" x 11" plastic container about 2" deep) so any beer overspill is contained. Today I bottled 26 twelve-ounce bottles & 15 twenty-two ounce bottles. My total spillage (waste) was about 8 ozs. or so. Wow what a pile of garbage. I bought this to use on our sour program so we can keep our 4 head machine on clean beer only. First the handle isn’t intuitive for me as I feel the fill should be on the main trigger and the purge should be on the thumb trigger instead of purge on the main and fill on the thumb. After about a case of bottles it was leaking out of the handle area and we lost a considerable amount of beer (that sells for $1 an oz) because of it, I haven’t taken it all apart yet to see if it wasn’t assembled correctly but for a brand new unit I expected better. The no bung stopper on the wand ment when filling the bottle we had to be extra careful with the keg pressure and we still lost way more beer compared to our four head machine with bungs and needle valves. Overall despite what the packaging claims this is a counter pressure filler but a cheap excuse for one that will never be as good as a proper bottler. We are sorry to hear about your experience with the Blichmann BeerGun. Reading your review, the unit may have been hooked up incorrectly. The main trigger actuates beer, and thumb trigger for co2 purging; as you stated how it should be. After disassembling and cleaning, check the connections. Should you find your still dissatisfied, we offer a 60 day return policy. Wish I would have bought one years ago. Great purchase. Works flawlessly. Easy to disassemble and clean and had no issues with leaks so far, 24 bottles in. As my keg collection is increasing my bottle collection is decreasing. However, there are those times I still need to bottle for travel or contests and the BeerGun is the perfect solution! Easy to assemble, clean, and use. It is just as advertised. I have used a counter pressure bottle filler for many years with limited success. Its messy, wastes beer, and is difficult to use solo. I just bought and used the V2 and it was super easy to set up and use. No mess, little waste, easy to clean, and best of all, left me with a great finished product. I always keg because I hate bottling, but this device makes it easy to bottle from my kegs. I've only used the gun a few times but it's working great right out of the box. The design is well done. Highly recommend. Normally I keg, but need to bottle occasionally for friends or events. Watched the how to video, washed & sanitized the Beer Gun and filled 12 bottles last wk. I reduced the pressure to the keg to 4-5 psi and was capable of filling the bottles with little foam. Great tool for even an occasional need. Would recommend. Works real good lasts long time, get you one. 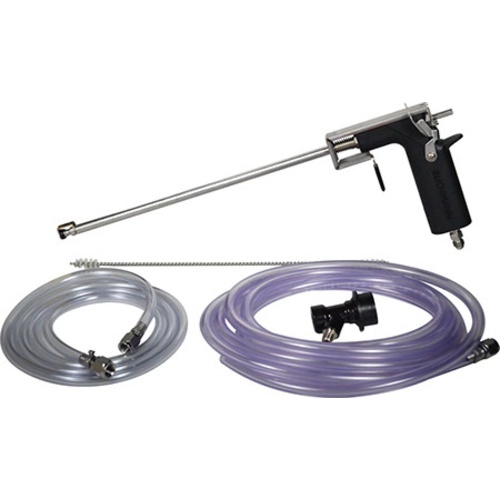 The Blickmann Beer gun is a great tool which every home brewer should have. It works easily every time and is simple to assemble and clean. Bottling has always sucked but this jem makes so easy it's almost fun. Works great, exactly what I needed. This is my first beer gun, and it’s a great product. Everything works with precision, and is useful if you just need to bottle small quantities for competitions or parties. It did take me a few batches to dial in the right carbonation level, But now I’m there, and it’s fantastic! Definitely recommend this bottle filler. Worked perfectly, no leaks as reported in other reviews. Wish I bought sooner. The gun works great. I do have very minor leaks with the beer not really with Co2. I work fast filling bottles that what I lose is negligible. I'd buy it again. I really like the beer gun. Cuts my time down and makes bottling a heck of a lot easier. Got this in store and it works great. No leaks but you do have to make sure everything is in place and snug before use. It sprayed on me once when I didn't place the tip right. It takes some prepping to set everything up and have it clean and sanitary but everything comes apart by hand. Its fill is consistent and great for bottling competition entry beers. I also waste less beer and like to purge air with CO2 trigger. Recommend if you bottle a ton of beer or want consistent results. As the previous reviewer said, this thing leaks like crazy. I eventually got tired of disassembling/reassembling the thing and cleaning up the beer that sprayed everywhere. I am send it back for a refund. For all their vaunted excellence, Blichmann is pushing a piece of hot garbage right here. Hi Dan - not sure what is going on there - certainly not normal. And certainly not acceptable. But I am 100% confident that we can get it resolved. Please reach out to us at support@blichmannengineering.com and we will get you up and going ASAP. Why would you screw with something that is proven reliable? Chinsy plastic handle that isn't even ergonomic. But the biggest thing that annoys me about the new design is the wobbly CO2 trigger and it's pressure cable. Thing leaks like crazy. On a long bottling day, I drained a 20# CO2 bottle. After stripping it down and reassembling it, it still leaked. I have CO2 gushing from around the push button actuator. Total crap design. Save your bucks and get the original. Hello MD - that is certainly not normal! Sounds like an o-ring issue in the grip. Please reach out to us at support@blichmannengineering.com and we will gladly replace the grip ASAP. I never used the original Blichmann beer gun so I can't offer a comparison there but I have used the "counter-pressure" style and it did the job, but I found it a bit cumbersome in use. I like the one-handed operation of this gun with triggers for gas and beer easy to use. I followed the instructions and dropped the serving pressure from my keg in half. Bottles filled up nicely with very minimal foam. Once the bottle is full it was very easy to pull the gun out and give the headspace a shot of gas before throwing a cap on.